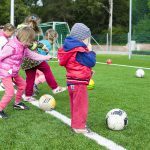 The Youth Sports Fund of Hardin County encourages and supports youth participation in recreational sports and making these opportunities available to any player, regardless of their financial situation. The Youth Sports Fund of Hardin County offers scholarships for families who need financial assistance for children to play sports. Contributions to the Youth Sports Fund of Hardin County are welcome. There are two ways to give. When donating through PayPal, please specify the Youth Sports Fund of Hardin County in the special instructions field after entering your payment information.